It was February 15, Sunday and our family decided to just have burgers for dinner. It was a bit strange but it was somehow fitting because a new burger place opened near our subdivision. I decided to experiment and see the difference between the two drive through burger establishments in F. Cabahug Street (Panagdait). For the past couple of years, Jollibee was the only major fast-food restaurant in the area. It has a good customer traffic because their location is near schools, offices, and residential areas. Just last week, Burger King opened its first drive through branch in Cebu and the new burger joint was built right beside the Jollibee branch that also happened to have a drive through service. I wanted to know which establishment has a better drive though service. 1. Burger King will have long lines. 2. Jollibee will be a breeze. We first went to BK and as expected there was a long line for the Drive Thru service. There were even a couple of cars behind me. At BK Drive Thru, you make your order at a large speaker with. 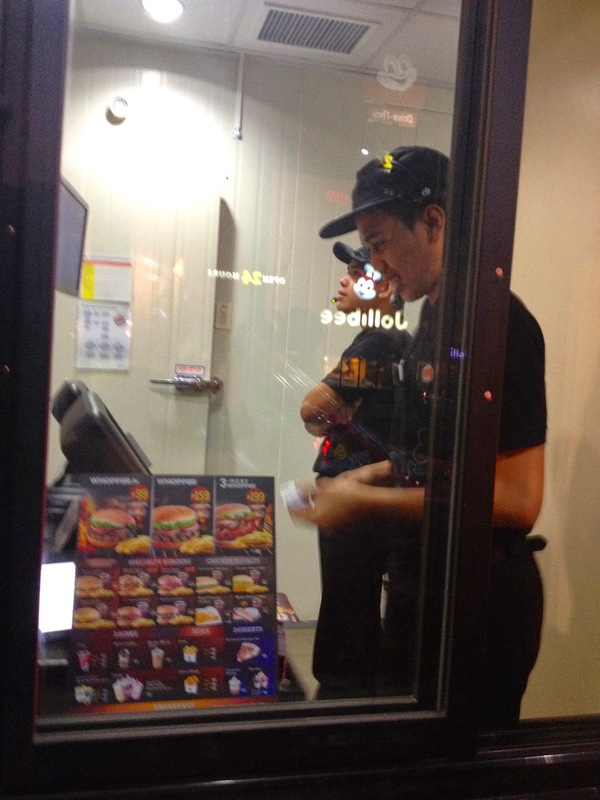 They installed cameras so that order taker can see the costumers. I ordered a 4-cheese Whopper Meal, a Mushroom Mozzarella Angus Steak solo, and an order of Onion Rings. For our order we paid less than 500 pesos. The 4-Cheese Whopper meal was already 199 pesos. The Burger King drive through took quite a while but I did not mind because I have company. After we got what we ordered, we proceeded to Jollibee. I am a bit relieved that there was a car in front of us. At least Jollibee was not totally shutout. We were planning to order a bacon mushroom yum meal and a bacon Aloha meal but the attendant told me that they do not have cheese and bacon so the only burger they have is the regular yum. Plus, they do not have fries so we cannot have a meal. And to make it a hat trick, the only drinks that they have is Coke. We were disappointed of course but when we realized that we cannot line up again at BK, we decided to just get 2 Yums, 2 Cokes and a 2-piece chicken meal without drinks. Since they weren't busy we got our orders really fast. It took us 20 minutes to complete the whole drive through process at BK. We entered at 7:14 and we finished at 7:34. The longest part was the line going to the order stage. We have to wait 12 minutes before we can order and another 3 minutes to pay. The food preparation took 5 minutes. At Jollibee, it was a breeze as we were done in 3 minutes owing to the fact that there were very few drive through costumers and they were using a limited menu. Jollibee might be faster but I was not able to get what I originally intended to buy. With the entry of a strong competitor the management of the Philippine's biggest fast-food chain should somehow step up and let BK know who is the king of burgers in Cebu. The Burger King is a formidable opponent and their new place makes the Jollibee look antiquated. People are still lining up at BK because it is new but price-wise they are much more expensive than Jollibee. I want to see if BK can sustain the momentum and win the fast-food war in F. Cabahug. The verdict: For today, I will give the victory to Burger King but I will give this match-up a rematch after 3 months to see who is the champion of burgers in the Panagdait area.